Investing in new woodworking design software can be a difficult decision for a business to make, especially for a smaller workshop. There is sometimes the view that woodwork design software is the preserve of the larger manufacturers, perhaps those who churn out high volume standard units. Smaller enterprises might are more focused on custom pieces, and perhaps the use of more traditional building methods. Time, the learning curve required and the price can all delay things. Then you’ve got to find the right solution and you still might not be clear on the returns for your investment. Well, the business environment is becoming increasingly competitive. You need to be able to keep pace with a fast changing industry or you’ll get left behind. We’ve got a great case study here featuring Mark Nichols & Co Ltd which specialises in built-in cabinetry. The workshop processes 8-9 projects each week. Mark is an active member of the Wood Designer Community and we are grateful for the time he has taken tell us about his business. I’ve tried all manner of design software but Polyboard does suit our business as we don’t really need to show high quality visuals (my East End chat will charm most customers), but the manufacturing is the key to speeding the work process up and I would imagine that a 60% profit on a job is easily achievable. 1. Initial measurements and spec during on site visit – precise measurements is the key, plus plenty of photos. 2. 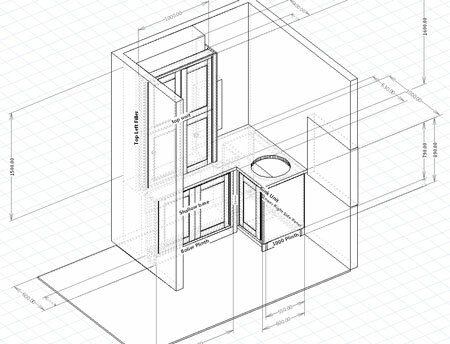 Design using Polyboard – no need to sketch and estimate the job from this any more, as it’s quick the draw the precise plans in Polyboard. 3. Export the cutting lists using a cutting optimization programme – click here for details on OptiCut, which integrates perfectly with Polyboard. 4. Quote using FreshBooks – this is an online service which clients can access too, for all their jobs. 5. Production, as fast as possible – the cutting lists and drawings are immediately available. Mark has a laptop with Polyboard installed in the workshop to check off any design issues just in case. They use a panel saw instead of CNC. They also use a lot of Festool equipment which allows them to output a lot of small scale jobs very quickly. Mark says this kind of system can see you cut design and production times by half or more. Finally, here’s an example of one project they’ve recently finished. I won’t quote the time savings in detail, but suffice to say Polyboard cut the process in half again. Would you like to try Polyboard for free? You can find out more about our furniture design software. Download Polyboard here. Test things out first with the free version. If you like it, you can buy it but we also have the option to continue to use Polyboard without ever having to buy it. This is our CabinetFile service. Polyboard could be just what we are looking for. I would be very interested to learn how Polyboard handles curved shapes – radius joinery parts and natural board timber components and sections.